Storms packing strong winds have rolled through Indiana several time already this growing season. Recent storms, in particular, caused quite a bit of damage to the corn crop in some fields. 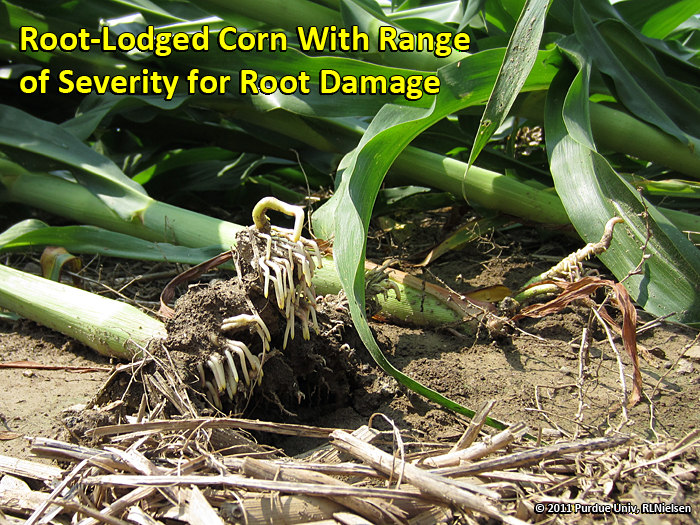 The damage includes minor leaning or bending of plants, outright uprooting of plants (root lodging), and the so-called "green snap" phenomenon where stalks literally break off or snap above a stalk node (often below the harvestable ear). The crop is particularly vulnerable to such damage from strong winds when it is in the latter stages of the rapid growth phase prior to pollination, wherein overall plant and root dry matter increases rapidly but more importantly, stalk internode elongation occurs very rapidly. Rapid elongation of the stalk internodes (the tissue between the stalk nodes or "joints") often outpaces the lignification of the same tissue. The development of lignins provide the structural strength to the stalk. Assessing the damage and predicting the eventual effect on grain yield from such damage can be challenging. The one certain advice that can be given is that such assessment should not be done the day after the storm. Rather, you should wait at least 4 to 5 days to allow the damaged plants to demonstrate whether or not they will recover. 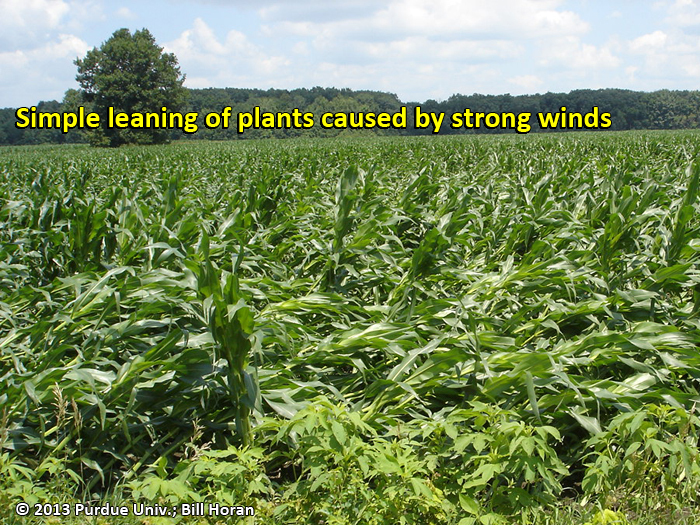 Simple leaning or bending of plants caused by strong winds represents the least of the damage. Such plants should recover most, if not all, of their uprightness AND if this recovery occurs prior to pollination, there should be little effect on the success of pollination. However, if the damage occurred near the onset of pollen shed and silking, then there may be some "shading" of the exposed silks (relative to pollen capture) by the leaves and stalks of neighboring lodged plants and pollination may not occur successfully. Plants that are root-lodged often recover by "goose necking" or gradually returning to uprightness, as demonstrated two years when similar strong storms caused wide areas of uprooted plants (Nielsen, 2011a, 2011b). Much like the assessment of plants that are simply leaning from wind, if the "goose necking" of root-lodged plants does not occur before the onset of pollen shed and silking, then there may be some "shading" of the exposed silks by the leaves and stalks of neighboring lodged plants and pollination may not occur successfully. The likelihood that "green snapped" plants will recover is obviously low. Plants snapped off below the harvestable ear clearly represent direct loss of yield potential, but plants snapped off above the harvestable ear may yet produce grain, albeit less than desired. Because such reduction in harvestable plant population occurs so "late in the game", there is less opportunity for compensation by neighboring plants and so the estimated yield loss will be approximately equal to the percent of green-snapped plants. Butzen, Steve. Brittle Snap Injury in Corn. DuPont Pioneer. [online] https://www.pioneer.com/home/site/us/agronomy/library/brittle-snap/ [URL accessed July 2013]. Nielsen, RL (Bob). 2011a. An Example of "Recovery" From Severe Root-Lodging. Corny News Network, Purdue Extension. [online] http://www.kingcorn.org/news/articles.11/FlatCorn-0728.html [URL accessed July 2013]. Nielsen, RL (Bob). 2011b. 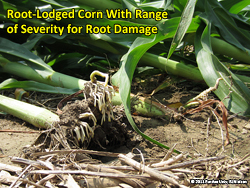 Prospects of Recovery for Root-Lodged Corn. Corny News Network, Purdue Extension. [online] http://www.kingcorn.org/news/articles.11/FlatCorn-0726.html [URL accessed July 2013]. Thomison, Peter. 2011. Green Snap" Damage to Corn. Ohio State Extension C.O.R.N. 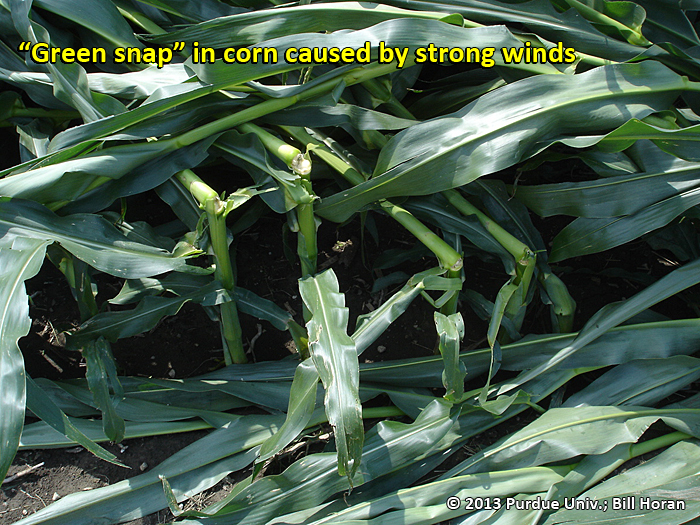 [online] http://corn.osu.edu/newsletters/2011/2011-23/201cgreen-snap-damage-to-corn [URL accessed July 2013]. © 2013 , Purdue University, an equal access, equal opportunity university. This material may be available in alternative formats. If you have trouble accessing this page because of a disability, please contact RLNielsen at rnielsen@purdue.edu.